In Medieval times, Piraeus was known as Porto Leone, a name coming from the enormous stone lion, which guarded the port's entrance. Its life had been joined to the sea since its creation. The city and its suburbs is an industrial zone of particular importance to Greek economy but its center nevertheless has broad streets, spacious squares, tree-lined avenues and parks. Running throughout Piraeus are the remains of the Long Walls. These structures were built to fortify Piraeus' three natural harbors after Themistocles' victory over the Persians at the battle of Salamis in 480 BC. The walls were extended all the way to Athens in 445 BC, destroyed after the Peloponnesian War but eventually rebuilt in 394 BC. Today, life in Piraeus is concentrated around its three ports. You can walk around the central harbor shared by cargo and passenger ships alike and watch the constant coming and going of goods and people from around the world. Then continue your walk to the other two harbors, Zea and Mikrolimano, maybe more touristy and more pleasant for visitors. The main harbor of Piraeus is one of the most important in the Mediterranean. Its ancient name was Kantharos. The port of Zea, now called Pasalimani, is one of the largest marinas in the Mediterranean. You'll get to it if you take Terpsitheas street from Akti Miaouli. No doubt you will enjoy some of the most impressive yachts and cruisers in Greece that are moored here as well as the Flying Dolphins (hovercrafts) that can take you to the Greek islands in the Saronic Gulf and some in the Aegean Sea. To the west of Pasalimani is Piraiki, the place to be for fish taverns, ouzeri cafes and bars where you can enjoy fresh fish, grilled octopus and ouzo at the sea front over viewing the Saronic gulf and the islands of Salamis and Aegina. Best time to go there is at sunset, an unforgettable experience. Munichia, also known as Mikrolimano or Tourkolimano the second yacht marina of the port, was once protected by the goddess Mounichia Artemis. Today it is a popular hang-out for tourists. You'll see a lot of yachts and fishing-boats and there are lots of fish restaurants. 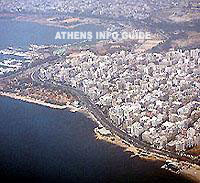 From there is only is a 15 minutes walk to the Stadium of Peace and Friendship in Faliro. Above Mikrolimano and built on a hill known as Prophetis Elias, Kastella is Piraeus' most fashionable neighborhood. If you walk towards the top of the hill, you will find yourself in narrow streets surrounded by picturesque houses with the Veakeio Theatre, well known for its summer performances, nearby. The view of the central harbor, Zea and Mikrolimano, from here is unique. Piraeus has its own flea market like the one at Monastiraki. One can find real bargains here. It takes place every Sunday in the Dragatsaniou and Mavromichali street. To get to Piraeus, you take metro line 1 at Monastiraki metro station. The end of the line station is right outside the main entrance of the ferry harbor in Piraeus.